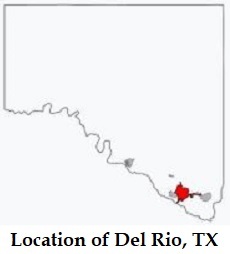 Del Rio is a small (20.2 sq. miles) border town of 40,549 in southern Texas, home to the Laughlin Air Force Base, the busiest U.S. Air Force pilot-training complex in the world. In May 2018, Bruno “Ralphy” Lozano, an openly “gay” U.S. Air Force veteran, was elected mayor of Del Rio in a landslide, with 62% of the vote. 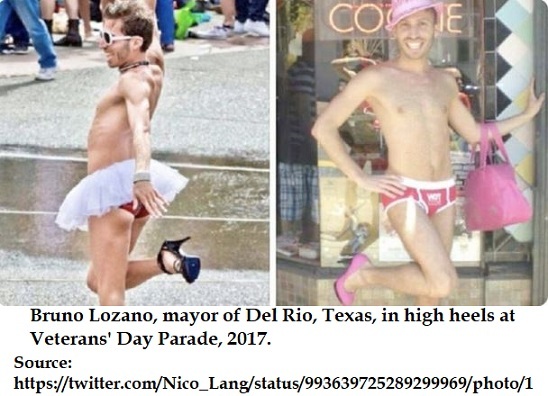 Lozano is a homosexual man who wore a tutu and 4″ high heels in Del Rio’s Veterans Day parade the year before he was elected mayor. Prompted by the military’s “Don’t Ask, Don’t Tell” (DADT) policy, Lozano joined the Air Force in 2004 on a 15-month special needs contract — whatever that means. There was once a time when a friend of his brought his boyfriend onto the base. The friend, who was highly discreet when in uniform, was busted, and it was Lozano who had to give him the bad news. Immediately after, he said to himself, “I just can’t do this,” and put in his papers. Does that mean we should brace ourselves for a transvestite U.S. senator or even president?